Donni, my new friend from down under sent me these pictures of her versions of the netted cuff bracelet (below) and her adorable barefoot sandals. 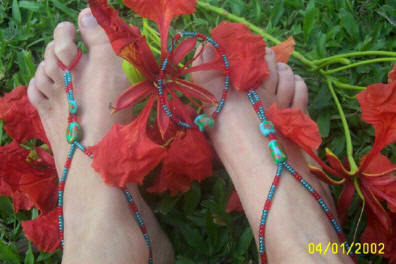 She used handmade Polymer Clay beads in her sandals, (and matching bracelet) and I think they look great! (Nice picture too!) Her cuff is beautiful in purple, and I really like the big beads she used as closures. Nice work Donni, thanks for the pics! Sandy, (another down under denizen) sent me this picture of her lovely version of the holiday bracelet. She wrote, " I chose my freshwater pearls and started off. Made it too long and felt clumsy using one needle. Started again using 2 needles. Realised half way through that I have made several bracelets in a similar pattern that I worked out from a necklace pattern a few years ago. Didn't know I knew how to do RAW - 1 or 2 needle - either. 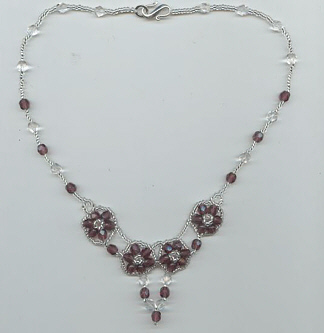 Colour doesn't show up well - flower petals are soft green - centre of flower soft lilac and the rest are natural." These three beauties were sent in by Erika, and I just love them! 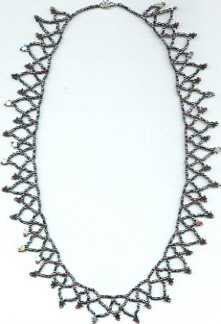 Her netted necklace is so nice, and her versions of Cecile's Wheel pattern are really fantastic! I especially love the way she did the necklace. I continue to be amazed at the many different looks people come up with using the same basic pattern! Great work Erika, and I can't wait to see more from you!